The Plain of Jars, in Laos' central Xieng Khouang province, is scattered with thousands of stone vessels but scientists have yet to discover their original purpose. Archaeologists have struggled to access the jar sites, many of which have yet to be cleared of unexploded mines and bombs dropped on the country during the Vietnam War. But Australian researchers now say that their use of drones which capture 3D images every 10 centimetres (3.9 inches) would allow them to explore sites like these that cannot be assessed in traditional ways. 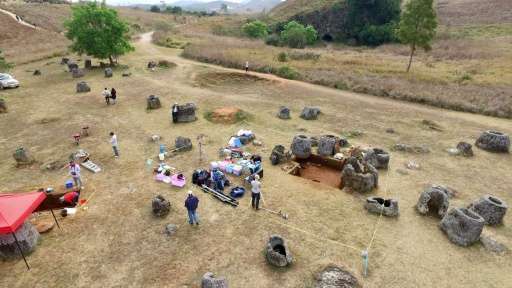 "The potential especially for places like Laos where there's a serious UXO (Unexploded Ordnance) problem is that using remote technology to explore and map archaeological sites is incredibly useful," Dougald O'Reilly from the Australian National University's (ANU) school of archaeology told AFP. "It decreases the danger of working in these places." Besides deploying drones to capture 3D images, O'Reilly said archaeologists were looking at using multispectral cameras which can capture light from invisible frequencies such as infrared radiation, and airborne laser scanning technology known as lidar to create centimetre-accurate maps. The data collected by researchers from ANU and Melbourne's Monash University will feed into the virtual visualisation of the Plain of Jars landscape, allowing archaeologists to virtually revisit the site as well as re-excavate it. Such maps could also be used to monitor changes in heritage sites over time. The technology could ultimately be used for museums, allowing visitors to wear a headset and walk around the site, or even be adapted for smartphones so anyone can visit a 3D map of a dig site from anywhere. "For museum applications, this is an amazing tool especially remote museums that are not at the site. So you can create this environment where people feel they are walking among the monuments in that three-dimensional context," O'Reilly said. "It's pretty amazing in that regard. When you are in the facility... it's absolutely breathtaking actually. The experience is quite overwhelming." Researchers from ANU and Monash University earlier this year uncovered ancient human remains and various burial practices at the Plain of Jars as part of the first major effort since the 1930s to try to understand the purpose of the vessels and who created them. 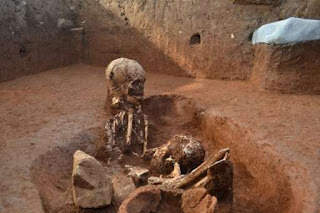 About 90 sites make up the intriguing area in the Southeast Asian nation, with the carved jars ranging in size from one to three metres tall (three to 10 feet).